Darker colored Citrine and a Rainbow Moonstone, Mica tinted polymer clay completely hand sculpted with fine pewter leaf accents. 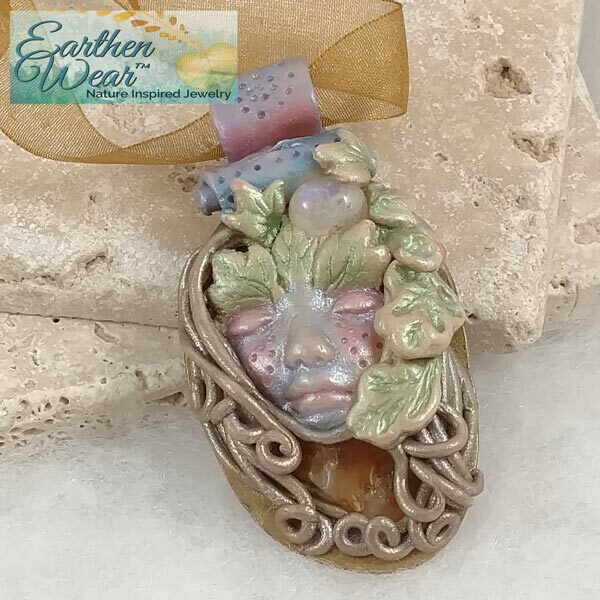 A sleeping Garden Goddess has Citrine at her center and a Rainbow Moonstone in her leafy crown. A wonderful combination, the Citrine cleanses and detoxifies the Kundalini Line and emotional body, regenerates tissue, and balances the spine on meridian and energy levels, and the Rainbow Moonstone soothes the emotions and mind, aids spiritual growth and development, and helps to heal the astral body..
Pendant is 1-1/2 inches in diameter and 1/2 inch thick. Cleanses and detoxifies the Kundalini Line and emotional body. Regenerates tissue, balances the spine on meridian and energy levels by balancing ch'i movement through the central nervous system. Clears, expands and aligns aura bodies, heals, opens and aligns etheric, emotional and mental levels. Opens the light body, and fills the aura with light and clarity. Stimulates intellect and mental clarity. Citrine has a trigonal crystal system and is in the mineral class of oxide in the quartz group. It gets its yellow color from small amounts of iron and slightly ionizing radiation. In contrast to Amethyst, the iron in Citrine has been changed by exposure to some sort of super-heating changing its chemical structure from Fe2 to Fe3 (basically burning the iron). Citrine is formed in the same primary manner as Amethyst and is found in pegmatites or formed hydrothermally in druses or clefts. Some of the Citrine in the marketplace today is almost brown looking. This is due to the fact that its probably Amethyst that has been "baked". While I have found it to hold many of the properties of naturally occurring Citrine, it does not seem to be as potent as when Mother Earth has done the cooking. Citrine is best used when worn in contact with the skin, or as a sphere or crystal when meditating. Citrine will help encourage your individuality, self-confidence and the courage to face and enjoy life. It will assist in making you dynamic and encourages the desire for variety, new experiences and self-realization. Citrine brings the "joy of life." It helps to overcome depression and to free yourself from oppressive influences. It will encourage you to be extroverted and to express yourself. Citrine helps to digest impressions we have received. It will stimulate the ability to confront and help ourselves and will aide in drawing conclusions rapidly and to understand them. I find it brings quick awareness and keeps me sharp on days I need to be "on my toes" and really focused. It's for those reasons that I could never recommend this one for good sleep. I find that I just lay there mentally buzzing and wide awake. Citrine stimulates digestion and promotes the working of the stomach, spleen and pancreas. It has been noted to alleviate diabetes in its early stages, fortifies nerves and has a warming effect. Citrine has a special affinity with Leo and Virgo. It's energy is Projective, Planet is Sun and its Element is Fire. 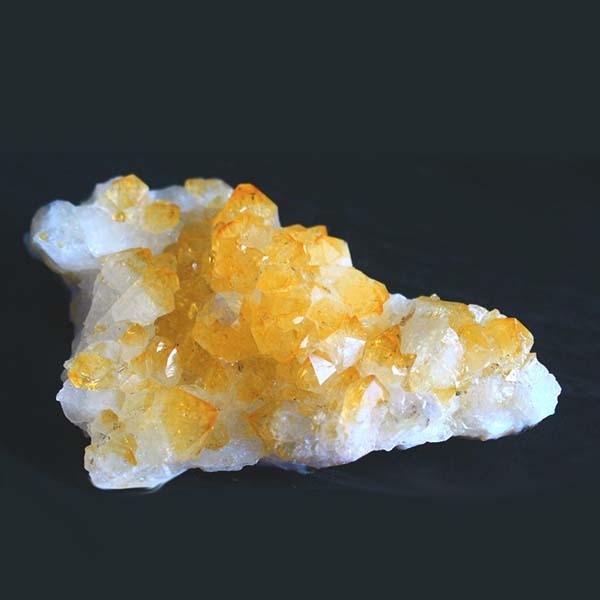 Persons involved with education or business will especially benefit from Citrine's positive energy. It's not often that I disagree with Cunningham's interpretations, but this is a case where we differ. He states that Citrine can prevent nightmares and promote a good nights sleep. It may prevent nightmares, but it would be due to the fact that you were wide awake (at least for myself and many others). Amethyst and Rose Quartz provide a good rest, Citrine is stimulating and generally gets most people charged up. The name of Citrine was used well into the 16th century for many yellow colored stones. It wasn't until 1546 that the name was clearly assigned to 'yellow quartz'. Shopkeepers of old believed that a piece of Citrine placed in their money till would draw more money to it. This is a practice still carried through today in modern pagan shops and apothecaries.